Can you imagine a turtle eating a plastic bag because it thought it was a jelly fish? A look at the photo from the Melbourne Zoo shows that’s exactly what has been happening all over the world. 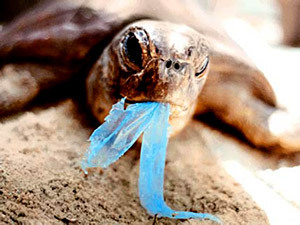 Do a Google search for “turtle plastic bag” and you will find thousands of pages detailing how marine life, not just turtles, are suffering from our careless use and discarding of plastic waste. While I’m finding articles dating as far back as 2000, I still see plenty of present day articles and blogs discussing how this is still a very serious issue with no end in sight if we don’t get actively involved. Now you might say that the easiest way to effect change is to request paper bags when grocery shopping. However, while paper bags degrade in a month’s time (versus the 500 to 1000 years it takes for a plastic bag to degrade), the energy usage to create that bag is enormous, not to mention that we are quickly cutting into our earth and losing all the lovely green scenery that we tend to enjoy. So what’s the answer? Responsible consumption. That, of course, will be an individual decision and while we would all probably like to be completely green, compromises may have to be made. For me, I was already reusing the shopping bags from my grocery store trips in waste containers all over the house. I’ll be switching to using a reusable canvas tote bag to do my shopping, but still use garbage bags to dispose of my waste. Once I use all my shopping bags, I’ll probably switch to containers that don’t allow for trash to get stuck in them (right now I have wicker trash baskets in the house), so that I can dump the trash into one main bag easily. To me, it’s worth all the effort if it will help save our marine life. Looking for a source of reusable bags? You can get them at Ecobags or Reusable Bags. So what are you going to do to reduce your use of plastic bags? this is very good information for the audience to know what kind of things they are doing without knowing themselves. they don’t know what kind of environmental issues they are making so if you read this send it to your friends please do that.